Transfers to Serre Chevalier are currently available from Grenoble Airport with Ben’s Bus. See below for advice on Serre Chevalier transfers from Turin Airport and Lyon Airport. Our shared airport shuttle service from Grenoble Airport to Serre Chevalier operates on Saturdays during the 2018 / 2019 winter ski season. We offer the best value shared transfers on this route. Our reps will greet you at Grenoble Airport and all our services stop at all the main resorts of Serre Chevalier. Our shared transfers operate from 22nd December 2018 until the 30th March 2019. We have 4 shuttles each day (and even more to the towns on the way to Serre Chevalier). We generally use large coaches, which means less environmental impact. 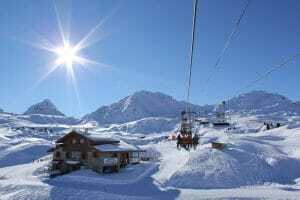 A cheap transfer from Grenoble Airport to Serre Chevalier with Ben’s Bus cost just £41.90pp Single & £77.50pp Return. With our group discounts, you could pay as little as £67.80pp Return and children get a 10% discount. For a full list of prices, check out our Prices Page or use our Online Booking Form to get a quote. Grenoble Airport is one of the closest airport to Serre Chevalier so it has one of the shortest transfer times. Of course it depends on the traffic, the weather and which resort you are heading to, but the transfer usually takes about 3 hours. We allow extra time for the journey when we know travelling conditions may be difficult, such as during the French school holidays. Ben’s Bus does not operate Serre Chevalier transfers from Turin Airport, Lyon Airport or Geneva Airport. Grenoble Airport (GNB) is 153 km from Serre Chevalier. The transfer time is about 3 hours. A Return costs from £67.80pp. Get directions from Grenoble Airport to Serre Chevalier. Turin Airport (CMF) is 129 km from Serre Chevalier. The transfer time is about 2 hours. Get directions from Turin Airport to Serre Chevalier. Lyon Airport (LYS) is 200 km from Serre Chevalier. The transfer time is about 3 hours 30 minutes. Get directions from Lyon Airport to Serre Chevalier. Geneva Airport (GVA) is 254 km from Serre Chevalier. The transfer time is about 3 hours 50 minutes. Grenoble Bus Station is 119 km from Serre Chevalier. The local buses are operated by Transaltitude or LER. We can also recommend Actibus for a private taxi. 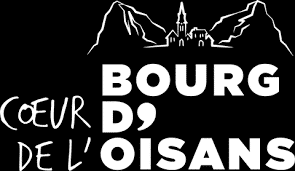 We have 4 bus stops in Serre Chevalier, at Briancon, Chantemerle, Villeneuve and Monetiers Les Bains. You can see a map of the entire Serre Chevalier valley below. This shows where all the different resorts are located. Our stops are conveniently located around the resort, close to the main accommodation centres. For more detailed information, visit our Grenoble Airport to Serre Chevalier page and expand the section “BUS STOP LOCATION“. Maps and descriptions of the bus stops are on the eTicket that we send you when you book with us. 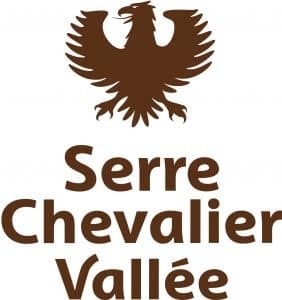 Serre Chevalier is not just one resort but more a collection of towns spread along the valley floor. It is situation in the Southern French Alps, in the departement of Hautes-Alpes. Each town is about 8km apart from each other, connected by a busy road that has free public buses running back and forth quite frequently. It’s is important to research each town before you book your holiday, as each as its own pros and cons. For instance, Monetiers les Bains has a quiet, authentic village feel to it whilst Villeneuve (literally translated to new town!) has a more modern feel. 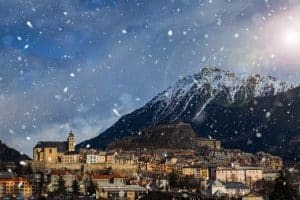 The highest town in France, Briancon, is a decent size with a year round population and a stunning old fort. The ski area is quite varied but with north facing slopes and a good snowfall record, it’s fairly snowsure. The 61 ski lifts covers 410 hectares of marked ski runs. The highest elevation is 2,800m and the villages are between 1,200m – 1,550m. It has 13 blacks, 30 reds, 25 blues, 13 greens. set in beautiful wooded mountains. We believe we offer on of the cheapest Serre Chevalier Airport Ski Transfers. Resort Information: Explore the Serre Chevalier Tourist Office website or try Ski Club UK Guide. Weather Forecasts: Try the Meteo France for Serre Chevalier website. Snow Reports: The Serre Chevalier Snow-forecast website seems well trusted by skiers. Live Webcams: Check out the excellent Serre Chevalier webcams. Pistes Maps: Try here for a piste map of Serre Chevalier.